My forays into the world of wool and spinning in general are coming on hugely and I am having a whale of a time processing the wool from literally just off the sheep's back right up to the finished knitted article. Still getting a bit of inconsistency there but improving. Its a time consuming business and when friends of ours mentioned that they had seen spinning wheels in a local Antique (junk) shop I was intrigued enough to take time out to go for a look. Of course I didn't come home empty handed. There were three or four wheels... one was just a jumble of bits on the floor - along with three or four distaffs complete with flax attached. My heart started racing, just a bit. I had already been told by an elderly Spanish acquaintance that they used to grow flax here in Extremadura, but not any more. It sort of explained why there was no real tradition of wool gathering. The annual sheep shearing is more about getting the wool off the animal and less about the quality of the fleece. The wool is almost worthless to the shepherd, but then I suppose if the local industry focused more on flax for linen making then no one would really care too much about the wool. The production of linen goes back several thousand years before ever anyone thought about what could be done with wool. And flax is incredibly easy to grow, but the production of the finished fibre for spinning is hugely labour intensive... even more so than the cleaning, carding, combing etc of fleece. The man in the shop reckoned that the wheel I bought (I told you I didn't come home empty handed) was from Holland, this makes sense, Flanders was always a big Flax producing region and if Extremadura did too then it stands to reason that the two areas might have had long standing contacts and perhaps even trade or competition with each other. I have no idea when exactly they stopped growing flax here, how the trade was organised is also a mystery. I love being a history detective. As my Spanish improves I will have to seek out some old people in the village and start quizzing. So, here she is... my new/old spinning wheel complete with old flax. I chose this wheel because it was the most complete, some of the others were arguably prettier, but nearly all were missing vital components that would make it hard to restore the wheel to working condition. It looks like it may at one point have been two wheels, and someone has combined them together to make one working wheel. They have covered a couple of nail heads with plastic(? it looks like plastic, could be bone, but more likely plastic) caps and then decided to pretty up the wheel with more of them. The distaff holder is broken, I think that is because the long distaff doesn't actually belong on this wheel. I think it should be a smaller one and since this one is too heavy it has broken the holder. There were other distaffs in the shop that were stand alone and would be positioned close to the wheel when working but not attached to it, I think this distaff is meant to be one of them but has lost its base. Someone cared enough to have it repaired. I wonder who is M uhl ? Or more likely who was M uhl. At any rate I hope she(?) was the kind of person who would be happy that we are going to fix up her wheel and then I am going to try my hand at spinning some flax. Ooooh, nice wheel! I've seen the decorative "buttons" before, mostly on wheels from northern France. They'd be able to tell you more on Ravelry, on the "Quirky Wheel" thread in the UK Spinners forum. OMG you are such a font of spinning knowledge Thriftwizard, I am so going to look up the ravelry link. 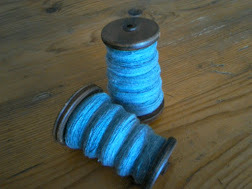 Thank you for your continuing support of my spinning efforts - it can feel a bit 'way out of it' over here. Wow, I have just spent the last few days reading your blog from the beginning. What an adventure you are on. You have done so much in the time you have been there. I look forward to following along with your wonderful life doing just what you want. I still have to explore your 'Food from the Finca'. Now I am saying WOW! Janice. From the beginning...? Goodness, alot of water flows under these bridges. But Welcome and I am so pleased to hear from you. The Food from the Finca has sadly not been updated in a month or two (you'd think we didn't eat) but even though we are retired we are always busy and sometimes something has to give. Thank you for your encouragement it is really appreciated.